E. F. ‘Teddy’ Norton was a member of the 1922 & 1924 Everest expeditions. He set the then world altitude record (without oxygen) of 28,126 feet and is regarded as one of the greatest Everest leaders. This volume of his private diaries and sketches is an extraordinary account. His water colours are atmospheric and beautiful; particularly of the mountain. These really should be reproduced as postcards or prints to be sold along side this slim but important landscape volume, or perhaps included with the book. 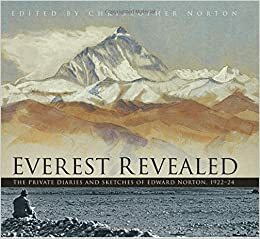 This is the first time these diaries, sketches and watercolours have been published and they detail the trials and tribulations of early expeditions to Everest. It really is a lovely tribute.